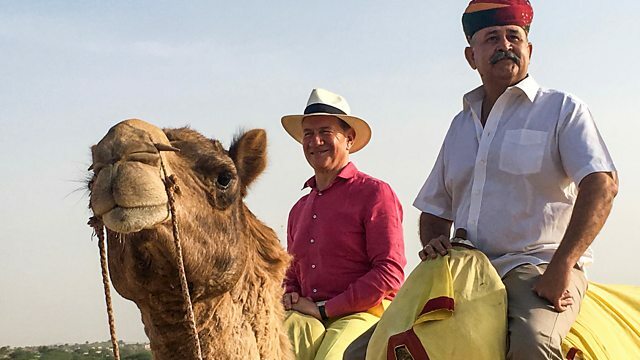 Michael Portillo embarks on a rail journey from the Thar Desert in Rajasthan to the Indian capital, taking in desert landscapes and dazzling historic palaces. Bradshaw's 1913 Handbook of Indian, Foreign and Colonial Travel in hand, Michael embarks on a stunning rail journey from the Thar Desert in Rajasthan to the Indian capital, taking in desert landscapes and dazzling historic palaces. From Jodhpur, Michael strikes out into the desert, taking a camel ride to a village where life has changed little in centuries, before embarking on the Jaipur-Agra-Delhi 'Golden Triangle' tour - India's must-do itinerary in 1913 as today. In Jaipur, Michael enjoys a gin and tonic in a lavish former palace before learning about the close ties between the rajahs of Jaipur and British royalty. He takes a polo masterclass from a maharaja and enjoys a shower with a difference, courtesy of an elephant. Continuing east, Michael breaks his journey in drought-prone Bandikui, where he marvels at the extraordinary architecture of one of India's largest and deepest step wells. In Agra, Michael first glimpses the Taj Mahal from a luxurious hotel room with a view. Heading for a closer look, he learns how this romantic monument built by a Mughal emperor was restored by a British viceroy at the time of his Bradshaw's guide book. Having pre-ordered an on-train lunch using a mobile app, Michael joins the crowds in 'unreserved class' en route to Delhi, where he samples street food in Chandni Chowk before boarding the sparkling new metro towards New Delhi. Journey's end is at New Delhi, built to house the rulers of the Raj after the capital moved from Calcutta in 1911 and designed by British architect Edwin Lutyens. But even as the crowds cheered King George V at the Delhi Durbar held the same year, anti-British sentiment was growing and soon after New Delhi was complete, India was granted independence. Shows from the BBC archives celebrating the beauty of locomotives.